Stunt cyclists share important message. 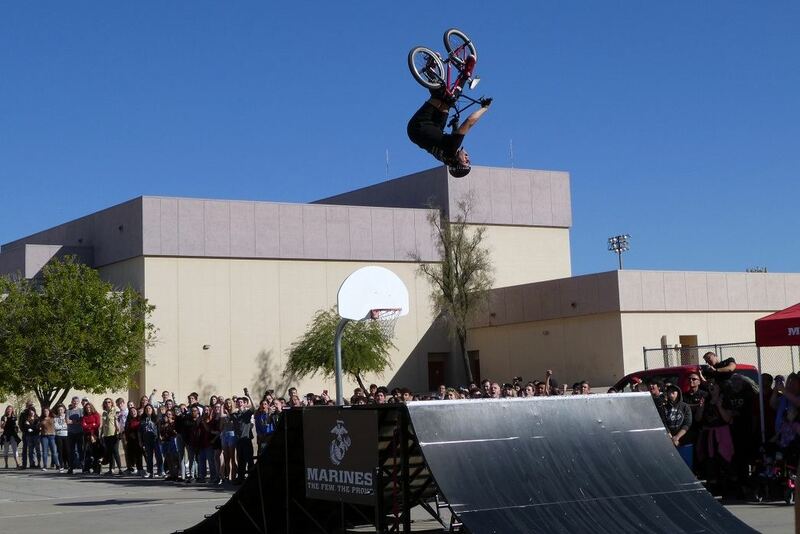 APACHE JUNCTION, Ariz. - Nov. 8, 2018 - PRLog -- Apache Junction High School, 2525 S. Ironwood Drive in Apache Junction took the anti-bullying message to new heights during a recent assembly where BMX bicyclists performed a variety of airborne stunts to drive home the understanding that bullying , especially cyber bullying, is not acceptable. The event was the kick off for the AJHS Student Council's efforts to launch their BKind Campaign. The demonstration, which is part of the Action Sports Association (ASA) High School Tours, is a high-energy action sports circuit that travels across the United States to support the Anti-Defamation League's No Place for Hate Campaign and the Campaign for Tobacco-Free Kids. "This exciting demonstration was a memorable experience that really drove home an important message," said Dr. Angela Chomokos, principal at AJHS. "We can say it all we want - bullying is not only bad for the victim; it's bad for the bully and everyone else involved. But using the format in which the points were showcased, the students really embraced the message, were engaged in the demonstration, and were excited to be a part of the event. Dawn Schwenkert and our student council members should be commended for bringing this event to AJHS." ASA brings in five of the world's top professional skateboarders, inline skaters and BMX riders from the X Games to perform on a state-of-the-art half-pipe, while an emcee delivers an educational message in a fun, positive and interactive fashion. Students can win prizes, get autographs and participate in a variety of contests. The show utilizes the allure of action sports and the credibility of the top pros to communicate a peer-to-peer bullying prevention and anti-smoking message.